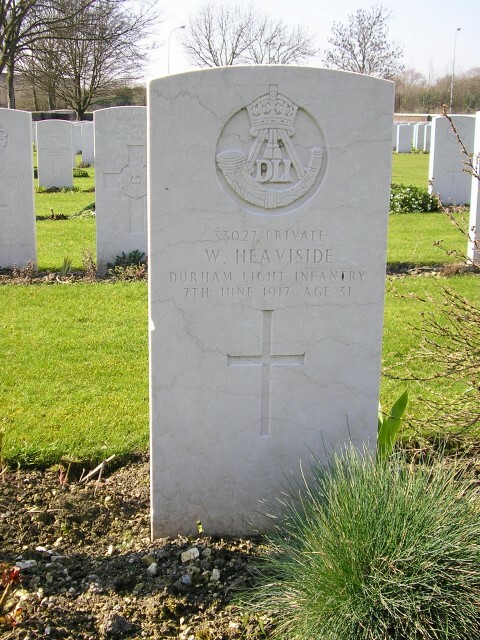 33027 Private William Heaviside, 2nd Battalion, Durham Light Infantry was killed in action, 7 June 1917 and is buried at Philosophe British Cemetery, Mazingarbe, France. He was 31 years old, married with 4 children and is commemorated on the West Auckland War Memorial and the Roll of Honour, Memorial Hall, West Auckland. William’s nephew, Ralph was killed in the Great War. Ralph was Richard’s son (William eldest brother). 51585 Private Ralph Heaviside, 22nd (Tyneside Scottish) battalion, Northumberland Fusiliers was killed in action 6 September 1918 aged 18 and is buried at Pernes British Cemetery, France and commemorated on the Evenwood War Memorial. In 1891, the family lived at Thrushwood, Evenwood and 5 year old William lived with his 26 year old sister Mary and her husband William Morley and his 23 year old brother Richard and his wife Mary. Both William Morley and Richard Heaviside worked as coal miners. William was employed as a hairdresser and the family lived at Mill Bank, West Auckland. William Heaviside attested 9 December 1915 at Bishop Auckland when aged 29 years 10 months. He underwent a medical examination 31 May 1916. He was 5”7” tall and weighed 103 lbs. and whist his physical development was described as “poor” he was considered fit for military service. Private William Heaviside was initially posted to the 20th Battalion, the Durham Light Infantry and was given the regimental number 33027. He entered France via Folkestone 10 October 1916 and joined the 2nd Battalion, the Durham Light Infantry “B” Company in the field 26 October 1916. The Battle Honours of the 2/DLI include Aisne 1914; Armentieres 1914; Hooge 1915; Flers-Courcelette, Morval, Le Transloy, Somme 1916; Hill 70, Cambrai 1917; Somme 1918. Private William Heaviside served at home between 9 December 1915 and 10 October 1916 and in France between 11 October 1916 and 7 June 1917. 1st – 1stS.L.I. (3 officers and 130 other ranks under Capt. E. Spink MC) raided enemy near Hendon Alley – 16 Germans killed and machine gun entrenchments blown in. 4th – Two officers and 40m other ranks of 1stS.L.I. raided same trenches and got in but no prisoners taken. 6th – Small raid 2ndL.I. (2 officers and 50 other ranks) unsuccessful – enemy barrage too heavy. 8th – Enemy small raid on 9th Suffolk’s at Newport Sap repulsed – 4 enemy dead left on our wire. “The dash of the men was excellent in every way and though the raid was a failure it was a gallant attempt. Casualties: Killed 7; Reported killed 2 (bodies not yet identified); Wounded 10 other ranks”. 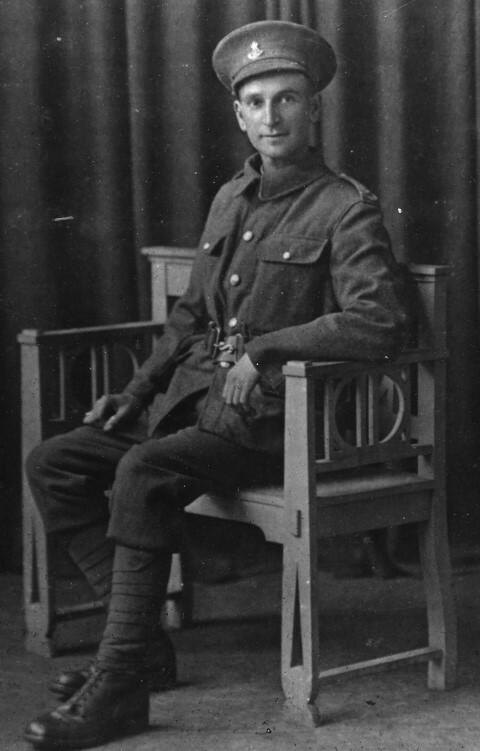 Private W. Heaviside was awarded the British War and Victory medals. “A Short History of the Sixth Division” edited by Major General T.O. Marden Appendix I.